Couldn't agree more! We need more variety in classical programming, that's for sure. And we also need to have orchestras that are willing to try new things. I think that management is often tasked with finding a huge crowd, forgetting that if you appeal to a core group of adventurous (but REGULAR) patrons, the "gamble" should pay off. However, I have to say that I have met my share of very "un"adventurous conductors - they really couldn't care less about anything new. To them, Mahler teeters on the edge. What to do with them, as they often make the programming decisions? Because like anything else, when you have a good advocate for a piece, it all falls into place, and the audience will have a fantastic time. I honestly think management gives the audience too little credit for being able to spot great music. But that gets me on another topic. Why must it necessarily be a "masterpiece" or a symphony with a proven track record? It's OK to program something that isn't perfect - very little music is after all! We seem to be thinking too much inside a narrower and narrower box. That comment was made by Stephen Evans about yesterday's post Reach is equally important in repertoire. The header image shows my LP set of exactly the kind of music Stephen is talking about; the main works are John Foulds' Pasquinade Symphonique No 1, Hubert Parry's Symphony No 3 (The English), and Havergal Brian's complete Symphonic Movements from The Tigers. That boxed set of masterly non-masterpieces featured in a 2009 post which explained that "I'm not going to start all that nonsense about rediscovered masterpieces. 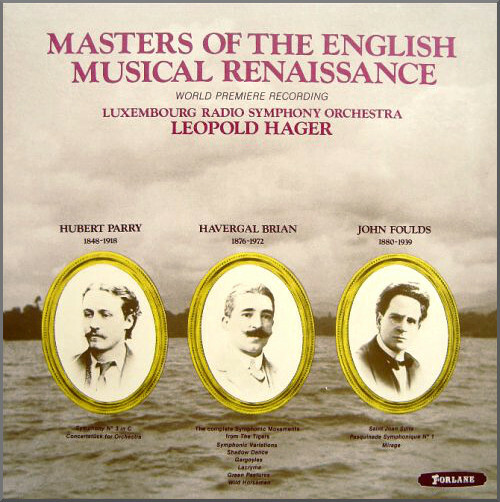 But if English music of this period floats your boat this is worth worth exploring". In another comment Rob Collis says "I gave up going to the Proms (other than those in which I've sung) some years ago precisely because the repertoire is so sclerotic and frankly dull". Striking confirmation of the foolishness of narrowing repertoire choice in order to expand demographic reach is provided in a new article titled "Almost half of Opera Philly’s audience is under 35: Here’s how they did it". Explaining how Opera Philly did it, general director David Devan outlines their strategy of presenting adventurous and observes that "Customers want more variety". To put David Devan's observation into perspective, Mahler's First Symphony - which is one of four Mahler symphonies programmed at the 2016 BBC Proms - has been played seven times in the last ten years at the Proms, and 2016 is the third consecutive year that symphony is being performed. This year also sees the sixth performance in seven years of Mahler's Fifth Symphony at the Proms, and the 2016 outing will be the fourth consecutive season that the symphony has been played. Please could BBC Radio 3 controller Alan Davey and Proms director David Pickard note that not only is it OK to program something that isn't perfect, it's also OK to program something that isn't Mahler. With thanks to reader Jerry White for the heads up on the Philly Opera article. Any copyrighted material is included as "fair use" for critical analysis only, and will be removed at the request of copyright owner(s). Also on Facebook and Twitter. These are important points - there's no question that the repertoire is shrinking in diversity. We need to hear more good music - and the "great" is the enemy of the good. BUT: 75% of the time the conductor holds the key. A conductor who's genuinely passionate about a particular work will, sooner or later, get it played. And they'll probably convince the audience (those who were present, at any rate – I’ll come back to that). Oramo did it with Bridge and Foulds in Brmingham, Elder does it with Bax in Manchester; John Wilson has championed Arthur Benjamin and Ilan Volkov continues to push (successfully) for everything from Glazunov and Koechlin to Jonathan Harvey and Hans Abrahamsen. But as Stephen Evans points out, a lot of conductors (often those with the highest profile) are unadventurous: either through limited imagination or experience, vanity (they want to play something guaranteed to show them off, and bring the house down), or just diary pressure – unless there’s a recording as part of the deal, why learn a new score that you’ll probably never get asked to conduct again when you could just pull another Mahler 5 off the shelf and be on your way to the next gig? You’ll hear them tell you that a certain piece “doesn’t work”. I know of one orchestra that spent the best part of a decade trying to find a conductor – any conductor – willing to conduct Rachmaninoff’s Third Symphony. Not exactly obscure, you’d think – but word has gone around that it “doesn’t really work”. Code for “I don’t know it and aren’t prepared to learn it?” Who can say? But time again the message came back: “No, I’ll do the Second or the Symphonic Dances. I don’t do the Third”. The other point: the idea that “the audience will spot good music when they hear it”. It’s true. The problem that orchestras face is not the audience’s opinion after they’ve heard it: it’s what they think BEFORE they hear it. Audiences won’t hear it (and like it) unless they choose to give it a try and buy a ticket. And my experience of concert programming was that if they see any unfamiliar name on a programme – whether that composer is the lushest of neglected romantics or the thorniest of modernists – they stay away. “So, be brave! Play it anyway! Educate them! They’ll come round eventually!” goes the response. Which would be ideal, in a world in which orchestras had US Big Five-size endowments. Apart from the BBC bands, most UK orchestras exist financially at subsistence level – break-even, or an annual loss, frantically made up through last-minute fundraising. They don’t have money to invest in long-term repertoire-building projects. If they’ve got a charismatic and convincing music director, they may take the risk – offsetting “experiments” here and there with overwhelmingly unadventurous repertoire elsewhere. But a sustained commitment to rare repertoire is a risk that most don’t feel they can afford to take while they’re continually one bad season away from insolvency. Pliable has spoken before of classical music’s “money problem”: sadly, it’s real, and it’s structural. My feeling is that passionate, adventurous, devoted conductors could break that cycle – but it’d take courage on all sides, and a lot fewer of the kind of “music lover” like the one who said to me a couple of years ago “Oh yes, I saw you were doing Bantock’s Pagan Symphony! Brilliant! But I’ve already got the Handley recording and I don’t have to sit with other people to listen to that”. The second English Renaissace was actually a conscious movement based around the circle of Lionel Tertis, and it involved viola music (the reference being to viol music in the "first" Renaissance). There is a whole Fantasy project that scads of excellent composers participated in. The composers on this recording, as far as I know, were a little bit earlier than the "actual" second English Renaissance composers. But clearly we have learned that England was never "the land without music." Very good points have been made by all. I have been fortunate enough to have inherited (from Geoffrey Emerson) an orchestra with such a commitment to music. I have been conducting the Scarborough Symphony Orchestra for 11 years and we always have wide ranging programmes. Our opening concert of 2026/17 season is Enescu's 2nd Romanian Rhapsody, Barber's cello concerto and Shostakovich's complete Suite from the Gadfly. I am continually thanked by out ever growing audience for this style of programming and we shall not change our outlook. My own thoughts are that we have a vast repertoire of Music to study, grow into and take pride in, so let's just do it.